Good morning, everyone! Today’s beautiful “Dream Home” comes from Karlita from The Purple Bow. Enjoy! Hi, this is Karlita from The Purple Bow, feeling very honored to contribute in La Dolce Vita, one of my favorite blogs. I had a lot of fun dreaming about my future home and about all the moments I would happily spend in this wonderful chic, classy, and natural with a dose of glamour home... welcome! 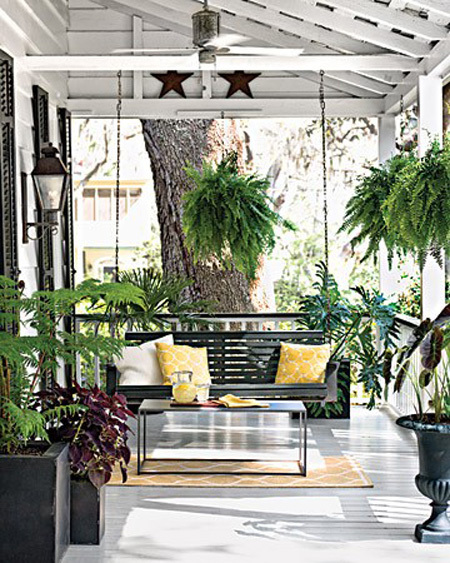 It all starts with a classy and modern porch with the perfect amount of natural elements, a structured hammock and table that allows my husband and I to read, make future plans and have some al fresco drinks. 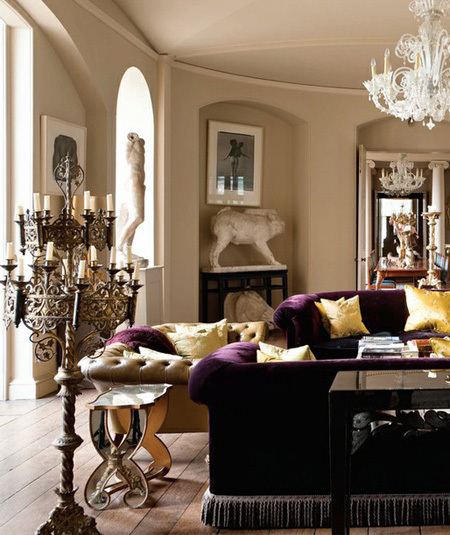 There's something magical, mysterious and royal about this living room; the purple velvet in the sofas emphasizes the artistic side in this room (purple is the color most favored by artists), the body sculpture, black and white paintings, and a beautiful french antique gilded floor chandelier that just speaks by itself. This is the family living room... comfortable, cozy and at the same time modern and stylish. The faux fur carpet against that golden sculpture, and the striped roman shades against the subtle pattern in the walls are just perfection. The dining room is the place I choose to show my love for lucite furniture; I love the elegance and modernity of that satin candle chandelier and that wonderful black and white marble floor. This room whispers femininity, beauty, romanticism, yet personality and style. Simplicity and balance at its best concept of glamour... Italian marble tile, unframed round mirrors and glamorous black crystal sconces make this the perfect guest powder room (of course there would be only one washstand). 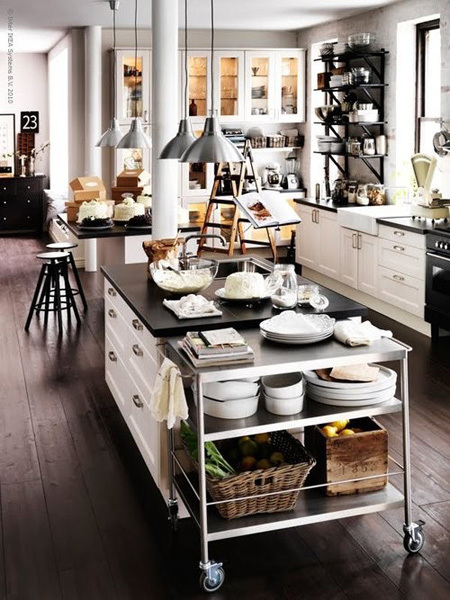 A classy, modern and industrial kitchen... I know this is not the most tidy and glamorous kitchen but I love cooking and I find this room as the perfect place to move around with easy access to everything, to feel free, experiment and try new and delicious recipes every weekday. The breakfast room reflects the morning freshness and natural light through sheer roman shades, and it's always liven up with fresh flowers. This is the white informal place where everyday dreams start. White color opens up my mind to creation, evolvement and everything new... so this is my home office; the mirrored desk is a reminder that my work should be the reflection of my personality, values and beliefs. I think the wood floor gives this room the warmth it needs. 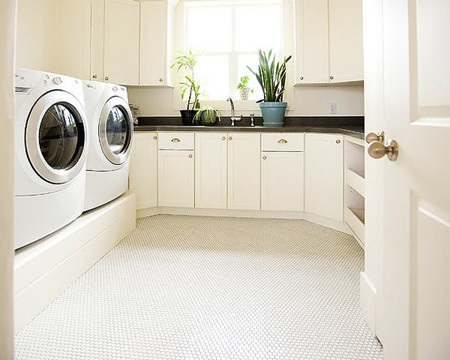 This is my clean and spacious laundry room... I think I am already smelling the freshness of this room, large enough to the 4 we will be in the family. I love everything about my master bedroom, it's luxurious looking but still very simple with its neutral color scheme. A romantic canopy bed covered in embroidered satin and its zebra glamorous touch underneath. Mirrored walls enclose my dream bathroom... a bathtub, an ottoman over a very grounding grey carpet, a custom made space to perfectly accommodate the towels, dark grey roman shades, tall branches... and how not to mention that painting and that black and white almost camouflaged chandelier that makes everything get together so well. 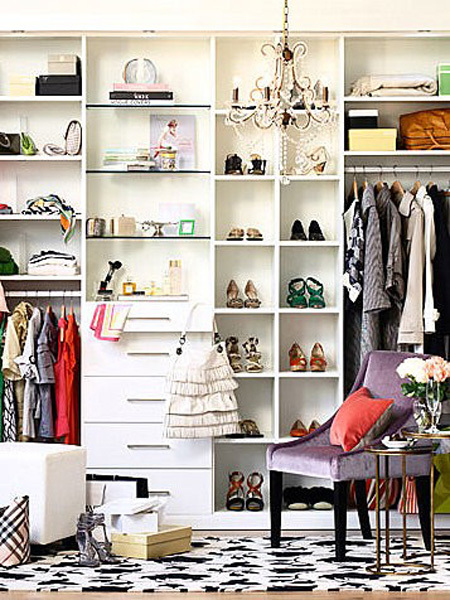 I don't know about my husband's left side of this closet, but this is the right side and it's MY closet. It has the space and visibility I need for my stuff; love the crystal chandelier, the rug and the purple chair with the feminine nesting tables at the side. This is my lovely baby daughter's room which gives her the moment and space to be the sweetest girl she will probably be just once in her life. I love light blue walls and white furniture for little girls, the large rug adds warmth and a place to play... I love the rocking chair and the topiary. This is my son's room... enough place to play, natural light and an introducing to arts wall is my dreamed room for my future son; the navy and green accents add the perfect freshness and fun. This is actually the sitting area in the Lawrence-Bullard for the Osbournes bedroom, but I couldn't stop thinking of it as the future room for my little daughter. The striped shade over the natural painting simulating the exterior, the little wall crystal chandelier and the princess purple velvety bed, makes this room part of a total fairy-tale story. 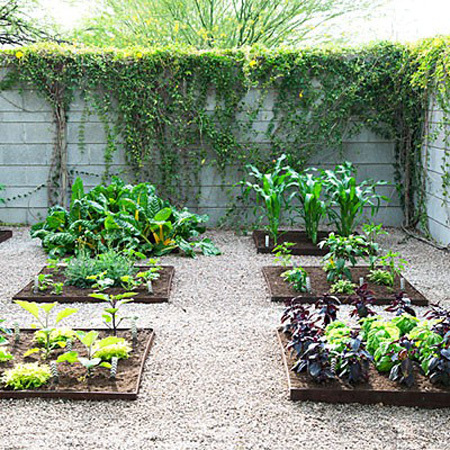 This is my side garden, the place from where I pick the freshest tomatoes, basil, mint... to cook everyday. And this is my back patio, a swimming pool big enough to swim and play volleyball with the family, and green space to celebrate the family birthdays... all framed by a beautiful and contemporary colonial black and white rear facade. What an amazing dream home. I love all the glamorous touches! all i can say is WOW - great spaces and design!!!!! You know, I adore this post.. I love her choices, but I love the most is the quote she wrote at the end. I'm a big believer of that. I love the luxury and glamour of this dream home. 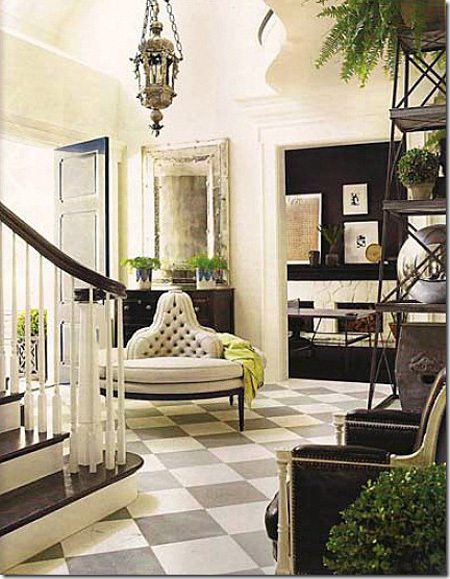 That foyer is one of my all time favourites and I ADORE the facade!! OOOOH! I like this one! Especially that backyard! 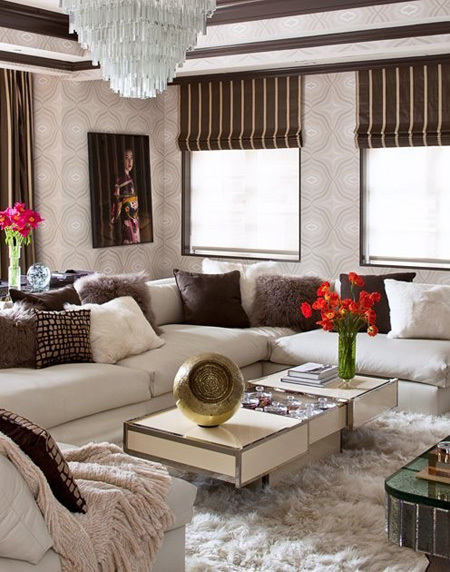 You had me at Tamara Mellon's family room. Gorgeous collection of images! 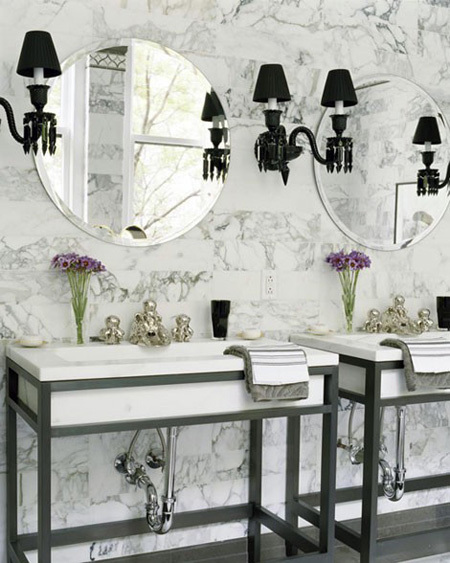 Love the lucite chairs and that gorgeous bathroom !! That chandelier in the dining room, i keep seeing it and love it. Does anyone know where its from? i want that dream home too!!! Pretty gorgeous pics going on here! Love your dream home...could move right in! !